Dog Parks in Taos, New Mexico! 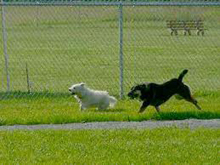 We research great places to go with your dogs!Please see our dog parks and hikesinteractive map. Leashed dogs only welcome. Conveniently located area for walking with the pooch. In the back of the park are the graves of Kit Carson and his family. His home is there too. Leashed dogs welcome. Great area for fishing, hiking, & picnics. 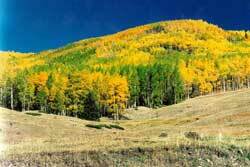 Some of the finest mountain scenery in the Southwest is found in the 1.5 million acres covered by the Carson National Forest. 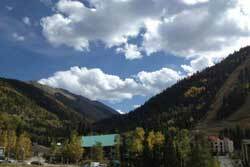 Elevations rise from 6,000 feet to 13,161 feet at Wheeler Peak, the highest in New Mexico. Our objective is to maintain that natural beauty. Leashed dogs welcome. 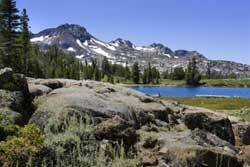 This is a great loop trail up through lush alpine scenery to Lobo Peak. 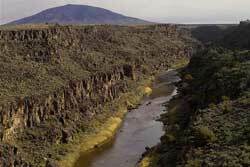 With all the stream crossings and greenery, you’ll find it hard to believe you are in New Mexico with the high desert of Taos just a few miles down the road. 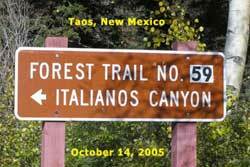 This loop starts about 10 miles up the Ski Valley road from the intersection with NM 522 north of Taos. Look for the Yerba Canyon trailhead sign. The whole loop is about 9 miles so if you prefer a shorter hike, just head up from either trailhead as far as you like and turn around. Some folks find all the stream crossings a bit of a pain, but scenery is worth it and your dog will love them! Leashed dogs welcome. Beautiful canyon where the Rio Grande & Red River meet. 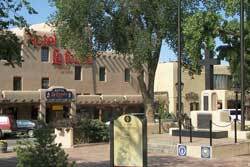 Located in the high plains of northern New Mexico, this area is rich with history, rugged beauty, and enticing recreational opportunities. 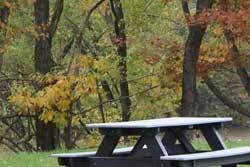 A back country byway, visitor center, campgrounds, picnic facilities, and trails are available for visitors. Several spectacular overlooks are found here, including La Junta Point, one of the most dramatic views in the state, overlooking the confluence of the Red River and the Río Grande -- and it is wheelchair accessible. Leashed dogs welcome. Use the Italianos trail to enjoy a hike that is favorite to the locals, continue on the Gavilan trail to loop back. The Gavilan Trail is a 2.43 mile long trail running from the small village of Amizette on State Road 150, a.k.a. Ski Valley Road. It is a steep and challenging trail climbing from 8,881 feet of elevation to 11,205 feet of elevation -- a rate of 1,000 feet per mile, which is among the highest in the area if not the highest. At the end of the trail it meets the Lobo Peak Trail and the Columbine Trail, providing access to Gold Hill, Red River, the Italianos Trail, the Manzanita Trail, the Yerba Trail, and many others. It has only two minor water crossings. Since the trail runs through a designated wilderness area only hikers or horses are allowed. Pack everything in and everything out. Leashed dogs welcome. 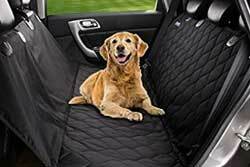 Perfect for the dog that likes to cool off with a swim. Boating, swimming, fishing, & hiking opportunities for owners. 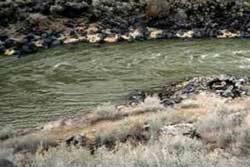 Thirty miles north of Santa Fe, NM , the snow-fed waters of the Rio del Medio and the Rio Frijoles begin a 2,000-mile journey and a 7,000-foot descent to the Gulf of Mexico. 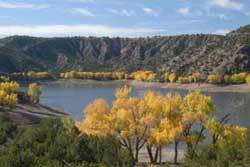 For a time they gather at Santa Cruz Lake at the base of the Sangre de Cristo Mountains near Chimayo, behind the 125-foot Santa Cruz Dam. Leashed dogs welcome. Fun for everyone with window shopping, shady spots, & cooling refreshments from local restaurants. Leashed dogs welcome. 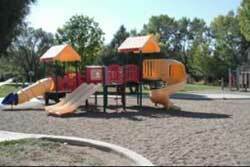 1/2 mile walking loop with picnic area, tennis courts, soccer fields, & playgrounds nearby. Walking and jogging on the ½ mile closed loop path is a real treat for many individuals. Fred Baca Park also boasts a five acre wetlands area along the Rio Fernando where people can sit and observe the wild life and its vegetation. The planting in this park was primarily done by many volunteers from the community. Leashed dogs welcome. Farily well known & easy to find, Black Rock Hot Springs average 97 F. A pleasant walk to the springs for your pet, followed by a pleasant, warm soak in the springs for you.